Last month, my photographer friend Jason Bleecher took some photos of some food I created. I’ll be sharing the photos and the recipes over the next few weeks! In a small pan, reduce the balsamic vinegar to half over medium heat. Slice the mozzarella and tomatoes into 1/4 inch slices and half the cherry tomatoes. 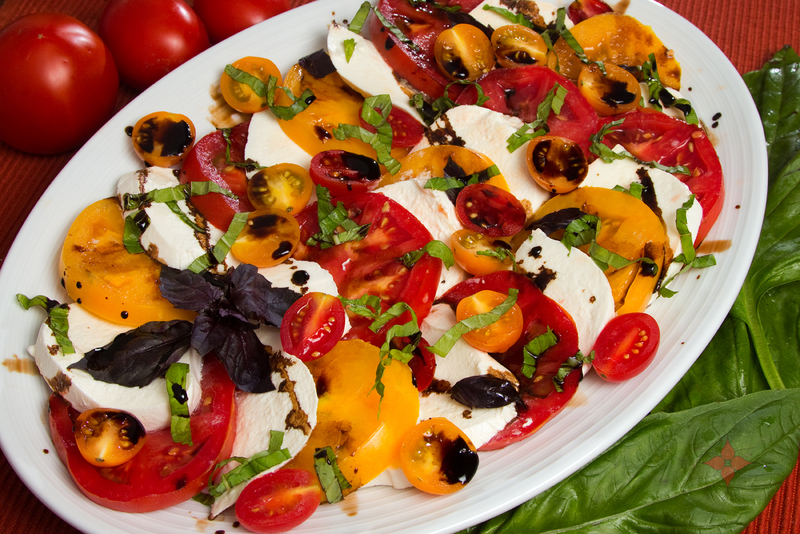 Arrange the tomatoes and mozzarella in alternating layers on the plate. Chiffonade the green basil and spread it over the salad, garnish with purple basil leaves. Drizzle the balsamic vinegar reduction and olive oil over the salad and season with salt and pepper. Simple and delicious, especially when tomatoes are in season. I have been eating tomatoes morning, noon, and night right now. I am certainly getting my fill. I made this easy pasta dish a few times now. It’s easy and quick and it tastes great hot or cold. The only thing you have to cook is the pasta! 1 box of pasta in any shape you like… I love mini-penne made by Barilla. Cook the pasta in salted water. Reserve at least 1/2 cup of the pasta water when draining the pasta. Place the onion, garlic and butter in a bowl and pour 1/2 cup of the hot pasta water them. Let the mixture sit for at least ten minutes, the butter will melt and the garlic and onion flavor will infuse in the water. Chop up the tomatoes and mix them in with the pasta in separate large bowl. Take the basil leaves, stack them up, roll them together, and slice them into thin strips (chiffonade) and mix them in with the pasta and tomatoes. Pour the pasta water mixture over the pasta and mix. 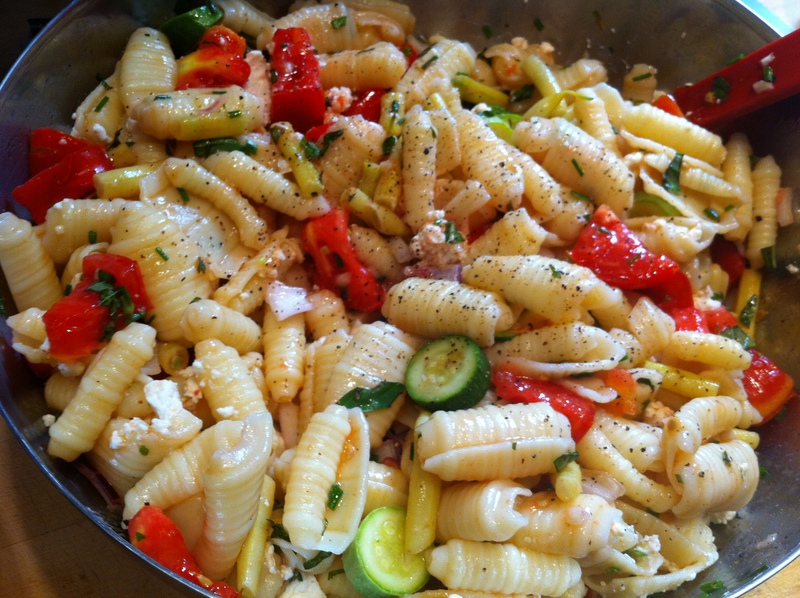 Break up the feta or cut up the mozzarella and add it into the pasta and serve. 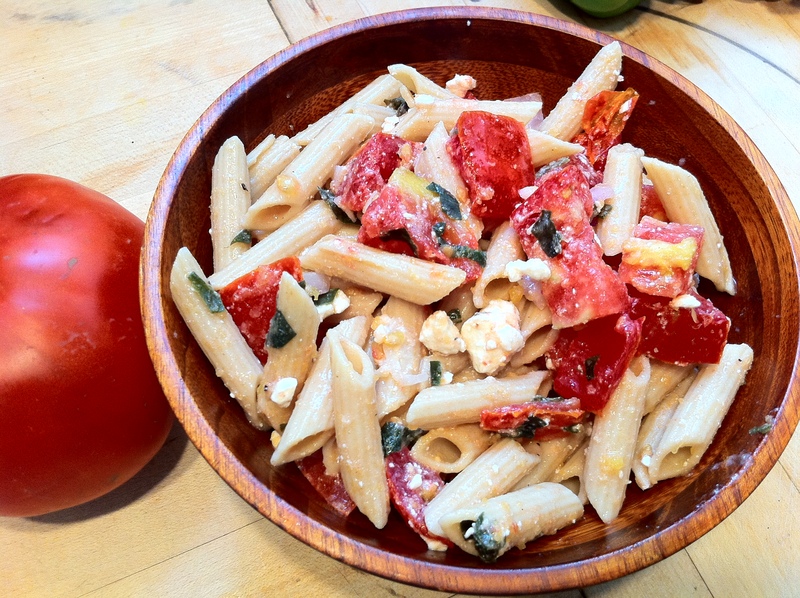 The heat from the pasta makes the tomatoes kind of melt, creating a sauce that coats the pasta. 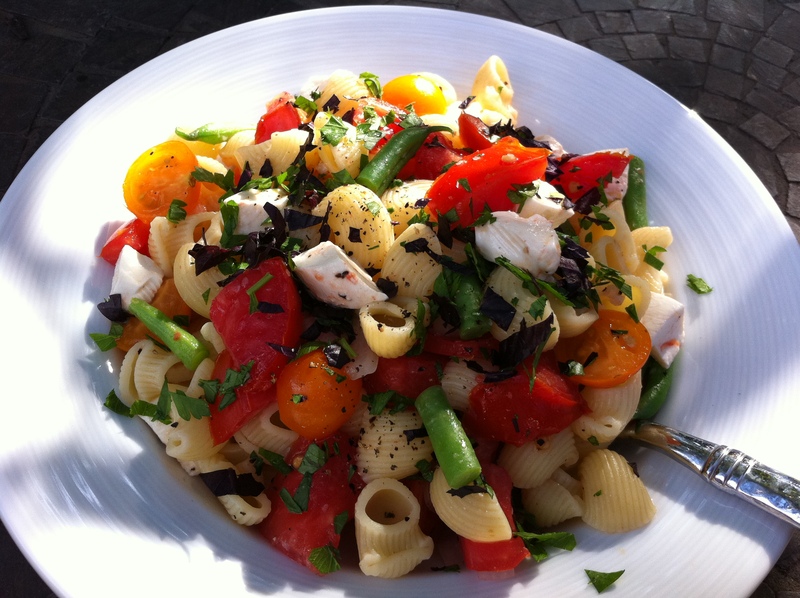 This meal is really good the next day because the pasta soaks up all of the flavors. This is the simple version I made the other night when I had some of my girlfriends over for dinner. I used whole wheat pasta this time. You could also add other veggies really easily. I added yellow wax beans and baby zucchini to one version of this dish. I just cut the zucchini into little circles and the beans into 1 inch pieces. You do not have to cook the veggies in a separate pan. Just drop them in the boiling water with the pasta about a minute before the pasta is done. You won’t have another pot to clean and they will be perfectly cooked, not over cooked. I have also been using local garlic because a few stands have it at market right now. I added green beans into this version. I used the same technique of dropping them into the boiling pasta right before it was done. I used the fresh mozzarella cut into cubes in this one as well. I also added some extra herbs in addition to the basil (I used purple basil this time) I also added Italian flat leaf parsley and a few chives. Be creative with your veggies! I usually just walk around market and get what ever looks the best and freshest. Simple, easy, quick and delicious. Dan really loves beer, which is probably why I really love beer. We are always on the look out to try something new. I am all about tasting new things- so I never get too disappointed when Dan wants to find local breweries or restaurants with extensive beer lists when we go places. I’m not a beer expert or anything, but I do like what tastes good and I’ll try anything. I’ll be giving you my opinion and some basic info about the beers I feature on here. 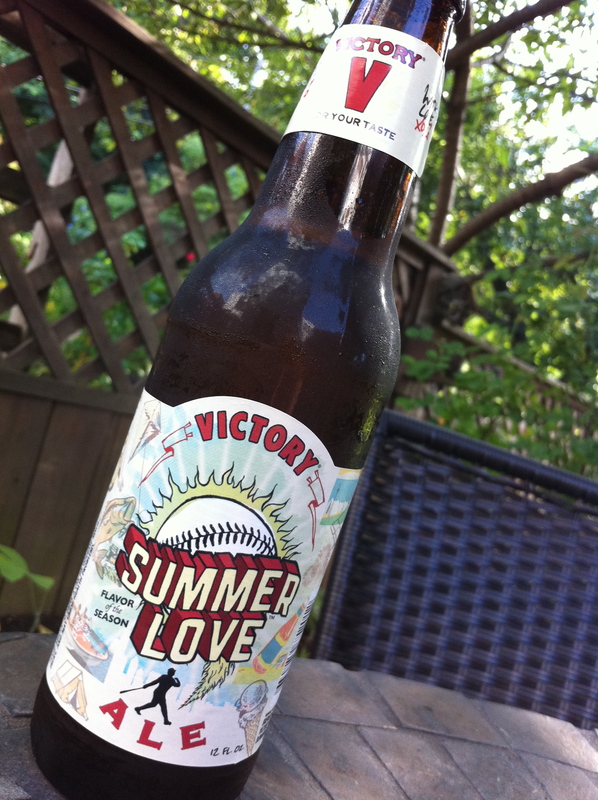 I’m starting my beer reviews with one of my favorites beers appropriate for the season: Summer Love from Victory Brewing Company. Summer Love was once only available at the brewery in the summer, but it is now conviently available in bottles this year… and often served in my backyard. I first tried this beer during a brewery visit with a few of my girlfriends. I am pretty lucky because the brewery and brew pub aren’t too far from where I live. It’s a great spot to catch up with some of my college buddies that live scattered over central PA. I am also pretty lucky that my college girlfriends like great beer. Summer Love is a light ale with bright and clean flavors. Grassy and Lemony, it’s everything a summer beer should be. It looks like a pilsner when you pour it but it definitely has the bolder flavors of an ale. It’s lightly hopped with American and German whole flower hops. It starts off light and finishes with a little hop kick you can taste at the back of your tongue. The ABV is 5.2%, not terribly high- making it a good beer to choose if you are going to be barbecuing all afternoon. This beer is part of the “With Love, Philadelphia XOXO” campaign. So if you are from afar and you are visiting Philadelphia, you’ll be able to find it all over the city this summer. Or you can pick up a case! It’s Perfect for summer outdoor gatherings, packing in a cooler, tailgating, baseball games, and beach going. I am currently planning my wedding right now and I am always on the lookout for food, drinks, and fun things that I could include in the party. I would love to feature this beer at the bar. How often is there a local beer with love in the name that I love to drink? I know it’s a little bit kitschy or cute… but I think this beer will make the cut. I have an abundance of tomatoes lately and I love salsa. 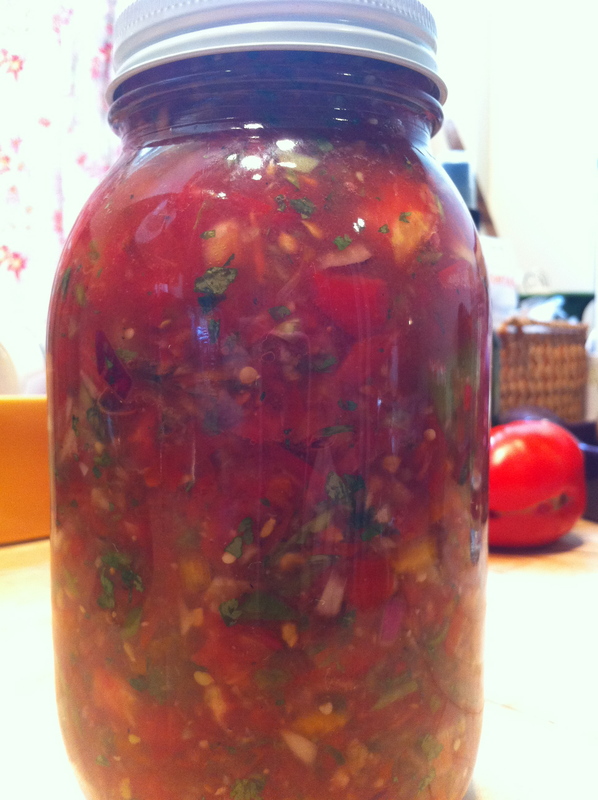 I gathered all of the ingredients to make my fresh summer salsa. There are so many veggies available right now that every ingredient in this is local. Yes, even the garlic is local! 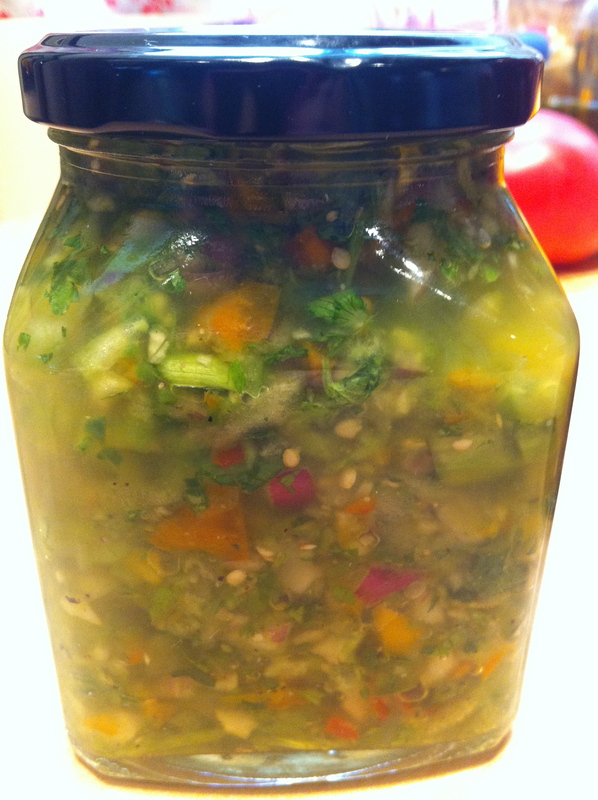 This recipe is both green tomatillo salsa and tomato salsa in one. It makes a lot so it is perfect for parties. It’s also super quick and there’s easy clean-up because I make it in the food processor. You can eat it just like this, as a green tomatillo salsa. 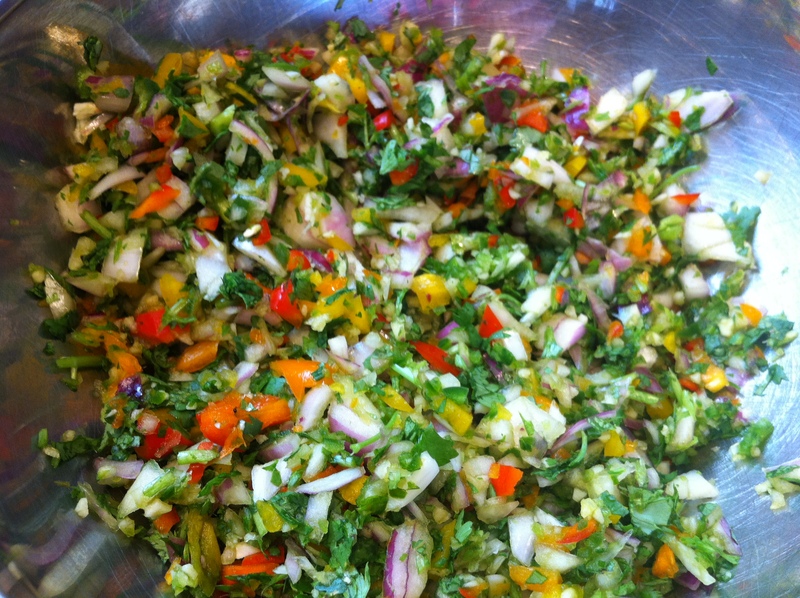 You can also use it as a base for other salsas. It’s really good stirred into chopped mango for a sweet salsa or stir a little bit into mashed avocado for a guacamole upgrade. Pulse 3 big (~ 1.5 lbs) red tomatoes in the food processor, working in batches if you have a smaller food processor. If you’re from Lancaster, I recommend the Jet Stars from Washington Boro that I wrote about a few days ago. Mix your tomatoes with about half (~1 cup) of the green salsa base from above. Season it with salt and pepper to taste. It makes about 4 cups.